LOCATION: * Located on the highly visible Northern side of Hwy. 261 (Helena Road). The property is on the “going home side” of Helena Road less than one block off of the busiest intersection in Helena at Helena Parkway and Helena Road (Hwy. 261). 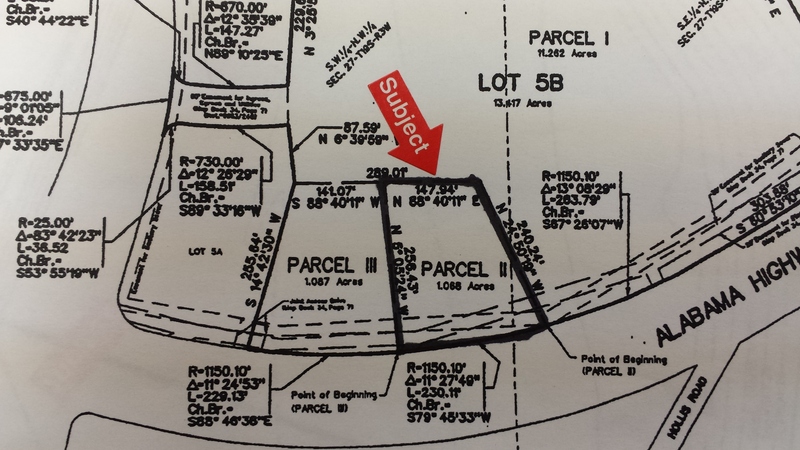 SITE FEATURES: * Large sized lot with prime exposure of 300 feet of frontage on Highway 261. The development of properties along this Corridor will tie in greatly with the already highly developed “retail district” located on all four corners of the “traffic lighted” intersection of Helena Rd. & Helena Pkwy. * Great site for retail, restaurant, office, small motel and other commercial or mixed uses. 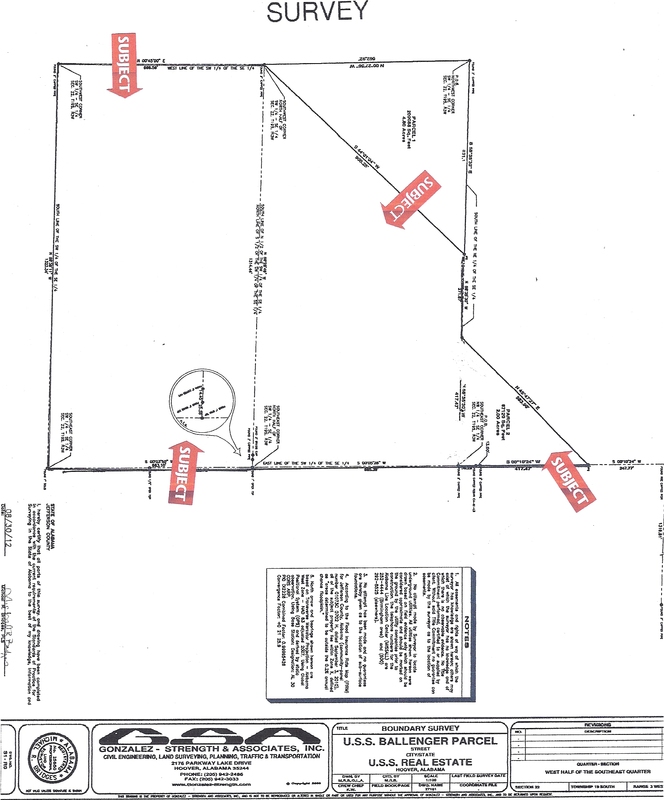 Land is close to and serves portions of Helena, Pelham, Alabaster and North Shelby County. * Highly visible with heavy daily traffic during peak hours. 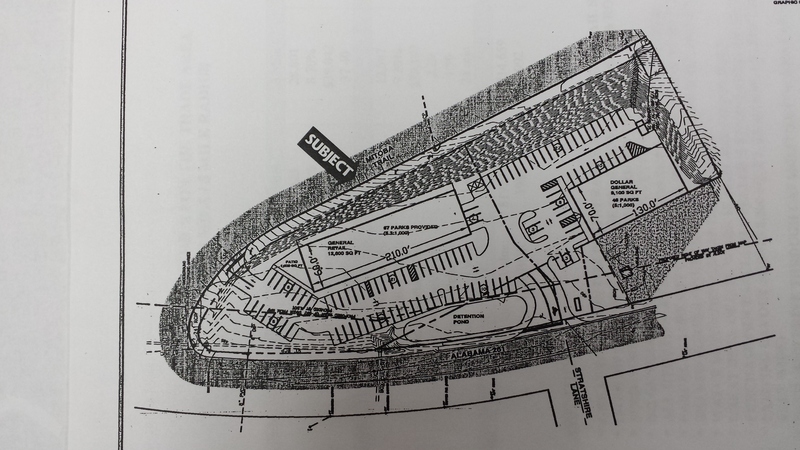 ZONING: * Located in the City of Helena and is presently zoned B2 - “Commercial”. LOCATION: This ridge top property is largely located in Unincorporated Jefferson County and a smaller portion in the City Limits of Hoover, between the I-459 and Hwy. 150 Corridors. It is assessable by Scenic View Drive off of Hwy. 150, almost directly across from Hoover Toyota. BUILDING AREA: Two story house of approximately 4,439 total square feet. * First floor includes: Foyer / Great Room w/ large fireplace, Kitchen /Dining area, Master Bedroom, Guest Bedroom, 3 baths, large wooden deck w/outside fireplace. * Fully Independent Basement includes: 2 Bedrooms, 2 Baths, a Den w/fireplace, Small Kitchen, 4 Car Garage, Laundry Room and a cedar closet. * Located on ridge top with a very private driveway and secluded hillside view setting with a very peaceful, natural wooded environment with great view on both sides. * Located in the middle of the heavily developed Hwy. 150 Corridor between the Galleria Mall (Hwy.31) Exit and the Hwy. 150 Exit. 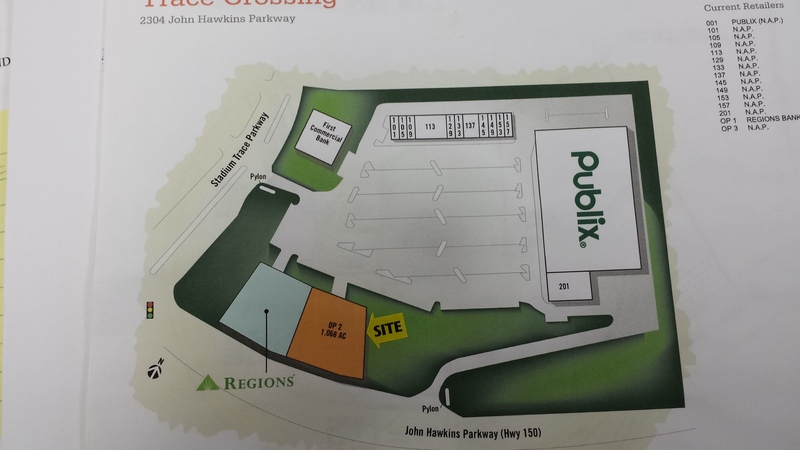 * Convenient to some of the best retail shopping malls, shopping centers and restaurants in the State of Alabama. in the City of Hoover. Any other special use will need to be rezoned. Property is hooked-up to B’ham Water Works. Presently on septic tank but sewer is located on Highway 150 and Scenic View Drive. Power is on site. SALES PRICE: $750,000.00 (Price reduced from $1,100,000.00) Owner Very Motivated to Sell!! MAJOR PRICE REDUCTION - SOLD! * GREAT LOCATION FOR RESTAURANTS ( PATIO AREA SHOWN), BANKS AND RETAIL SMALL SHOPS. * PRIME EXPOSURE & VISIBILITY ON THE “MORNING” SIDE OF HWY. 261. * TRAFFIC COUNT OF 18,3700 CARS PER DAY (2010) AND GROWING! * LOCATED ADJACENT TO A 9,100 SQUARE FOOT “DOLLAR GENERAL STORE”, WHICH SERVES AS AN ANCHOR DRAW FOR THE SITE. * ITS’ HWY. 261 ENTRANCE HAS ALREADY BEEN WARRANTED FOR A TRAFFIC LIGHT AND SO HAS A SECOND EGRESS AND INGRESS TO MITOBA TRAIL. * LOCATED ON ONE OF THE FASTEST GROWING RESIDENTIAL / RETAIL CORRIDORS IN SHELBY COUNTY. * AREA IS PRIME FOR A NEIGHBORHOOD CONVENIENT TYPE SHOPPING DEVELOPMENT BEING LOCATED IN A DENSELY POPULATED RESIDENTIAL AREA BETWEEN TWO OF THE FASTEST GROWING CITIES IN THE COUNTY: PELHAM & HELENA. * HAS A NEIGHBORHOOD DRAW OF 3 MILES W/ POPULATION OF 36,936 (2013 EST.) AND AN AVERAGE HOUSEHOLD INCOME OF $72,951. HANDLE UP TO 12,600 SQ FT RETAIL DEVELOPEMENT. SIZE: Lot 2B .92 acre 40,074 sq. ft.
ZONING: "O-I (2) Office and Institutional District"
* Located within the center of a 5 mile radius of one of Metro Birmingham's busiest retail/restaurant/office corridors. All information herein is from sources deemed reliable. Bruno & Associates Realty, Inc. makes no representation to its accuracy and it is provided subject to errors, omissions, change of price or terms, prior sale or lease, or withdrawal without notice. SALES PRICE: $325,000.00 - OWNER WILL CONSIDER ALL OFFERS! being built) and within three (3) miles from the heavily developed regional Galleria Mall retail development. Master Bedroom, Guest Bedroom, 3 baths, large wooden deck w/outside fireplace. 4 Car Garage, Laundry Room and a cedar closet. natural wooded environment with great view on both sides. Exit and the Hwy. 150 Exit. in the City of Hoover. Any other special use will need to be rezoned. Property is hooked-up to B’ham Water Works . Presently on septic tank but sewer is located on Highway 150 and Scenic View Drive. Power is on site. SALES PRICE: $950,000.00 (Price reduced from $1,100,000.00) Owner Very Motivated to Sell!! provided subject to errors, omissions, change of price or terms, prior sale or lease, or withdrawal without notice.